I enjoy my students, they are so creative and with a little direction they run with their own ideas. Once they get the technique I provide them with lots of color and material choices. 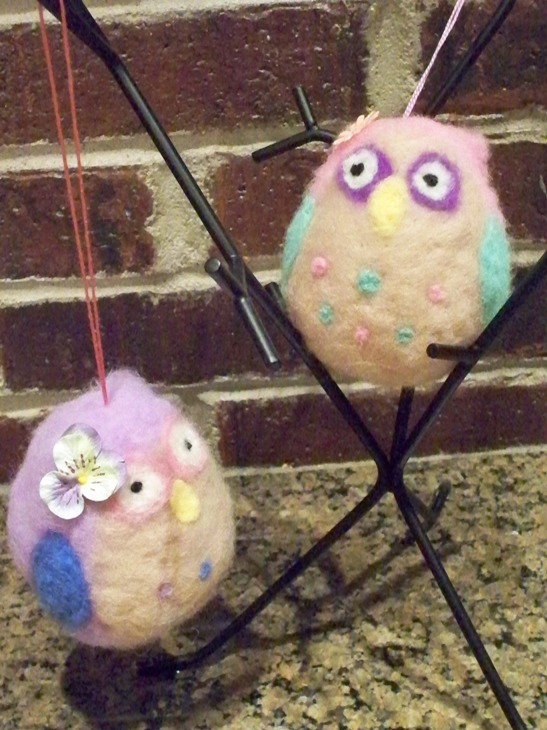 One of my students wanted to needle felt owl ornaments for her new young stepsisters. Since the girls both love pink and purple she decided to reverse the colors with one being more pink and the other more purple. They turned out so cute and will be sweet cherished gift, their first Christmas together as a blended family. Creativity is a gift in itself, taking the time to craft a gift is special. Making something special for someone you love, in the act of creating love is woven in and so there is no greater gift than that. It is the season to create with love! Always! Thank you Melony! I take that as such a compliment coming from you, your work is wonderful!